What do You know about Gdańsk? The oldest sources mentioning the Żuraw as wooden port crane equipment date from 1367. Its present look refers to the image of the middle of the 15th century. The first wooden crane totally burnt down as a result of the 1442 fire. A new crane was built in the years 1442-1444. The crane had a defence function. 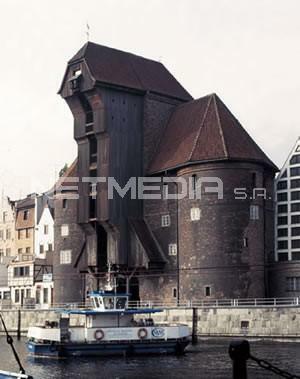 It consisted of two brick towers with a wooden lifting mechanism installed in between. 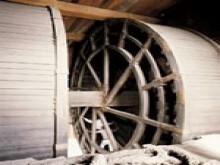 The reloading equipment consisted of two pairs of wooden wheels which were put in motion by port workers. The crane was used to put up masts and reload goods. It was also a city gate. The Żuraw belonged to the city and was managed by a crane master. As a result of war the Żuraw was destroyed in 1945 – the wooden part of the construction burnt down and only 60% of the brick part remained. After the war Żuraw was rebuilt and transferred to the Polish Maritime Museum. Nowadays the inside of the Żuraw is used to organise exhibitions connected with Gdańsk port life. Since 2003 visitors have also been able to enter the lifting mechanism. For safety reasons and fire precautions, it is not allowed to operate the crane. The building adjacent to the Żuraw which can be seen on 16th century drawings used to be a granary. In the 19th century it was adapted for housing purposes and after the war a municipal boiler house was installed there. In the 70s the boiler house was taken over by the Polish Maritime Museum, which redecorated the building, adapting it for office and exhibition purposes. Presently the building is called Skład Kolonialny (Colonial Collection). In the future the Polish Maritime Museum intends to establish here a Maritime Culture Centre, expand the building on the side of the Hanza hotel and make the elevation uniform with the urban-historical guidelines.